Today, the company Opera Software has announced the beta version of Opera Mobile 10.1 for Android, which can be downloaded for free from the app store Android Market. So far, Opera Mobile browser for Android has been focused only on the mobile phone manufacturers to pre-install a manufactured product. 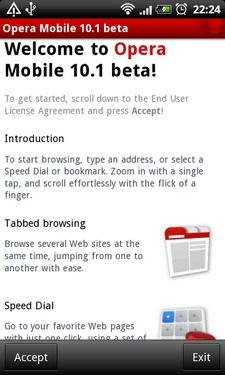 Now the browser is available for download to all owners of phones running the Android version 1.6 and above. As the company claims, Opera Mobile offers a faster loading of web pages, flexible control over the preview page, smooth zoom (pinch-to-zoom) and scrolling (scrolling). Another proprietary feature Opera – Speed Dial – provides quick access to your favorite Web resources at the touch, and Password Manager eliminates the need for everyone to type the secret code on the telephone keypad. In addition, the technology Opera Turbo, available in the browser Opera Mobile, to compress the traffic to 80% and speed up loading of Web pages at work on “slow” data channels, such as GPRS. Download Opera Mobile on your phone with the Android OS version 1.6 and above is available for free from Android Market app store or at atm.opera.com / next, by typing it into the browser on your mobile phone.